Stretching 10 feet from wingtip to wingtip, California condors (Gymnogyps californianus) are the largest land birds in North America, and once ranged from British Columbia to Baja California and inland to the Rocky Mountains. Historical and scientific evidence suggests they once bred in the Pacific Northwest, yet the California condor has not been documented in Oregon for more than a century. Condors play a critical role in ecosystems by recycling nutrients and disposing of dead, disease-ridden animals. Known to some indigenous peoples as 'thunderbirds', they have long been revered by humans, but a confluence of pressures during the first half of the 20th century nearly drove them to extinction. This once-common insecticide has the effect of thinning the shells of bird eggs, which can cause them to break before they hatch. Though banned, condors can still ingest the chemical when they eat the remains of a contaminated marine mammal. Lead poisoning is the single greatest threat to the survival of condors. When condors and other scavengers feed on the remains of animals shot with lead ammunition, lead can enter their bloodstream, affecting the central nervous system and leading to starvation or predation in their weakened state. Using lead-free ammunition spares scavengers a slow death and provides a vital seasonal food source (gut piles) for many animals. Early settlers used large amounts of strychnine to kill predators like wolves and grizzlies. Scavengers feeding on these carcasses were poisoned also. Condors sometimes eat plastic, glass and other trash, likely in an attempt to gather enough bone fragments to feed their chicks. Microtrash can prove fatal when it accumulates in a chicks' digestive tract. The California condor was the first species to be listed under the Endangered Species Act in 1973. By 1987, the entire wild population had been reduced to 22 wild birds, which were taken into captivity to form the nucleus of today's California condor recovery program. The first birds were reintroduced into the wild in 1992. Condors returned to Oregon after nearly a century in 2003, when six breeding pairs were brought to the Jonsson Center for Wildlife Conservation in Clackamas County. The isolated 52-acre facility is designed to limit human contact, which maximizes the young condors' ability to thrive in the wild once they are released. There is space for 53 condors at the Jonsson Center, including 11 breeding pairs. Eggs are laid from January through March. Once an egg is laid, it is removed from the nest to an incubator. When the egg begins to hatch it is placed back with the parents. Chicks hatch 54 to 57 days later. By June, all chicks have usually hatched. Following an annual tradition, tribal partners have the option to name the condor chicks. When they are about eight months old, hatchlings are moved from breeding pens to a fledgling flight area. There they begin their flight fitness preparations and learn to socialize with adult "mentor" condors. Young condors receive aversion training that teaches them not to land on power poles. A mock power pole in their enclosure is rigged to provide a mild electric shock if they land on it. Oregon-raised condors then move to field pens at one of the five release sites in Mexico's Baja California peninsula, central and southern California and northern Arizona. After several months in the field pens they are released into the wild. From a population low of 22 birds in 1989, there are now more than 400 condors, with half flying free. 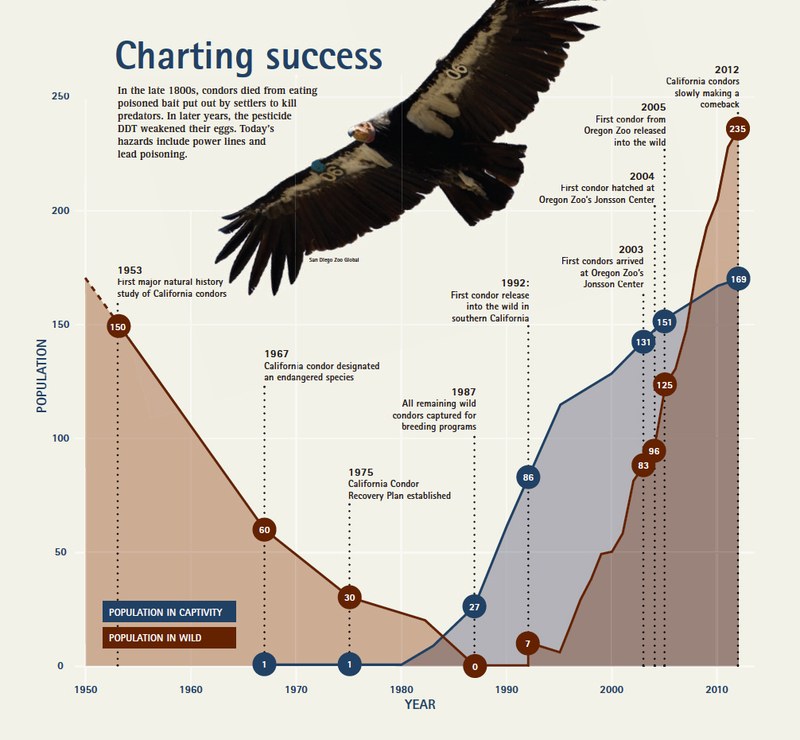 Since 2004, 51 Oregon Zoo-reared condors have been released into wild areas in California and Arizona. Seven are currently breeding in the wild. The Oregon Zoo would like to see California condors once again soar over the Pacific Northwest, but it is not a simply a matter of releasing birds into their historic range. A successful reintroduction hinges on protecting the released birds from premature death. Until the problem of lead poisoning is resolved, condors will not be fully recovered in the wild. Condors are both a biological and a cultural indicator species that provide valuable information about the diverse communities that sustain them, including humans' own creative capacity to give back to and support natural ecosystems. The U.S. Fish and Wildlife Service, working with many other agencies and partners, implements and oversees the California condor recovery program. Today three zoos (Oregon, San Diego and Los Angeles) and The Peregrine Fund's World Center for Birds of Prey, serve as the recovery program's breeding institutions. The Condors of the Columbia habitat is home to three adult birds from the zoo's Jonsson Center for Wildlife Conservation condor recovery program that cannot be released in the wild.